Horatio Nelson attended The Paston (Grammar) School in North Walsham, Norfolk, England - which was founded in 1606 by Sir William Paston. He attended the school with his brother William from 1768 to 1771. It was documented in The Naval and Military Journal of 1845 that the young Nelson had a 'sweet-tooth' and a local cake-vendor at the school told of the embryo Admirals distinct liking to round sweet balls of treacle and sugar. These were later sold by the cake-vendor and became known as 'Nelson's ball's'. Similar confectionery was sold carrying this patriotic name until the turn of the 20th Century. 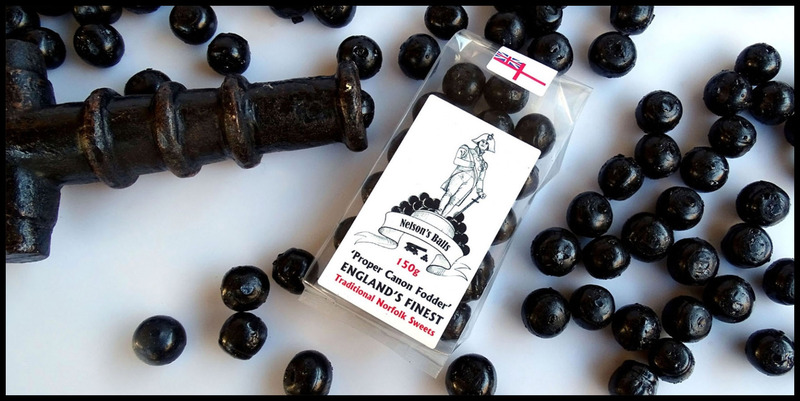 Chocdrops Norfolk, have resurrected the heroic sweets for new generations to enjoy! Other distinguished 'Old Pastonian’s' included Thomas Tenison (Archbishop of Canterbury), Allan Smethurst (The Singing Postman) and Stephen Fry (British actor), although there is no evidence to suggest that any of these eminent people had ever seen or tasted Nelson's balls!